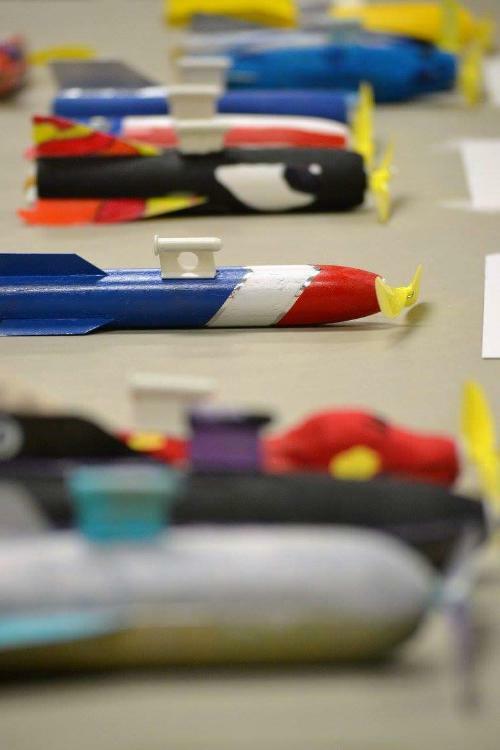 The Space Derby is similar to the Pinewood Derby or Rain gutter Regatta except that the models are miniature rockets, which are propeller-driven, and powered by three rubber bands that travel along a heavy mono filament fishing line. The rockets are carved by the boys, with the guidance of their parents or other family members. 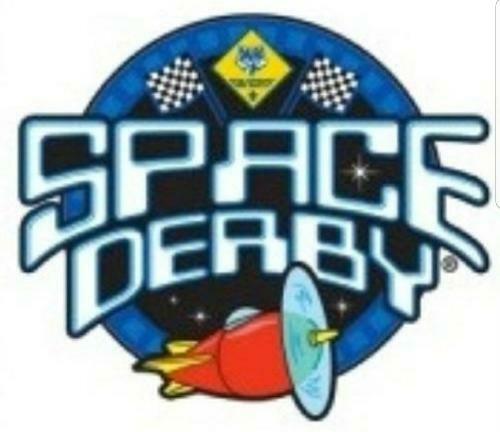 Space Derby kits with building instructions are provide by the pack and extra kits are available from Capital Trophy. 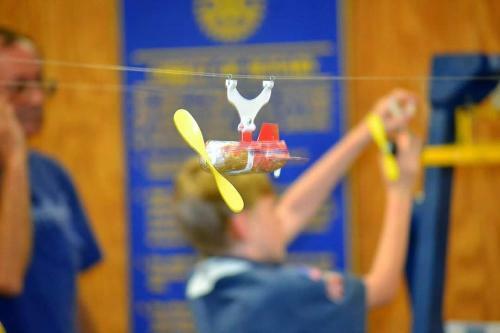 Cub Scouts will find the Space Derby exciting experience. Join in the fun as the countdown begins for the space race of the century! 1. Only basic materials supplied in the Official BSA kit may be used. The hanging devise supplied in the kit must be used. 3. The rocket body may be no longer than 7 inches, not including the propeller and fins. Width 2.75 inches -Three rubber bands per rocket. The pack will have a limited supply extra rubber bands on hand if a scout should need them. 4. There are no restrictions on the weight or design of the rocket. The rockets may be detailed in any way as long as it does not exceed length restrictions, is flight worthy, structurally sound and does not interfere with another rocket during the race. 6. Scout may use graphite powder between the propeller and the bushing if desired. Other forms of lubrication are prohibited. 7. Prior to each heat, rocket numbers and lane assignments will be announced. Pilots are to take their rocket from the space hanger and give them to the official winder and then take their position at the finish line. Upon completion of the race, "Space Command" will give the rocket back to the pilot to place back in the designated space hanger. 8. At registration judges will assign a number to the rocket and separate it by Den. 9. Once the rocket is submitted for entry, no further adjustments can be made except in the case of mechanical failure. 10. The race will be double elimination. A rocket must lose twice before it is eliminated. 11. Any entry that experiences a mechanical failure will be allowed to re-race if it can be repaired during the same heat. It will count as a heat loss if it cannot be repaired prior to the beginning of the next heat. All repairs of this type must be done with "Space Command" observing and certifying as to its flight worthiness. 12. 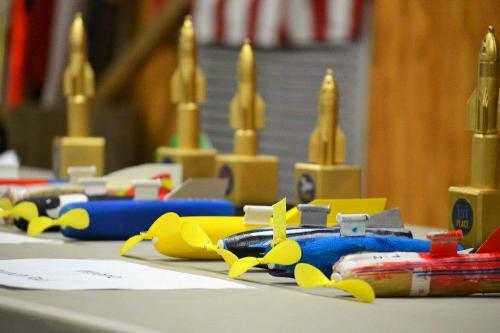 In the event that all rockets don’t reach the end of track, the one that goes the furthest is declared the winner. 13. One Rocket Only per scout. 14. Only the Racing Volunteers will be allowed in the Space Track area. 16. All rulings by “Space Command” are FINIAL. · Inspection and registration of rockets. 1. Every boy brings his rocket to the inspection table to have his entry checked and numbered. 2. Then the scout goes to the registration table where his name and rocket's number are entered on a heat sheet. 3. Contestants report to gatekeeper, who lines them up in the order in which they will compete. As the cub’s time approaches he will begin to wind his rocket. 4. When the cub scouts name is called, he hand his rocket to gatekeeper who will hook his rocket onto the guideline assigned to the scout. 5. The gatekeeper releases the rockets. 6. The winner takes his rocket to the registration table for recording. He then returns to the spectator area to wait until his name is called again. 1. Rockets are to be submitted to the registration table. 2. Each rocket will be inspected, registered and assigned a sticker with a spacecraft number. 3. After registration, rockets will be held by "Space Command" in the designated space hanger until race time. 4. If at registration, a Rocket does not pass inspection, the owner will be informed of the reason for failure, and will be given time within the official registration period to make the adjustment. 2. Make the propeller wire engages propeller and is secure. 3. Rocket body is shaped as small as possible. FAST ROCKETS HAVE A MINIMUM PROFILE. 4. Inside of body is hollowed out to reduce weight. If possible, select the lightest body you can obtain. LIGHTER ROCKETS GO FASTER. 5. Plastic hanger is fastened securely to body. 7. Lubricate rubber bands in castor oil or a glycerin/soap mixture. 8. Propeller nose button is lubricated with graphite. 9. Rocket body is waxed to a high gloss to decrease wind resistance. 10. Fins are accurately aligned so rocket flies straight. 1. Lubricate rubber bands before the derby. Lubrication prolongs the rubber bands life and power and will help reduce the possibility of their breaking during the competition They can be soaked overnight in castor oil. 2. Remember, it takes three rubber bands to fly each ship properly. 3. Experienced rocket racers "warm up" their space ships by gradually winding the rubber band motor to it full capacity. We will have a maximum of 100 turns for our race. 4. A small hand drill is excellent for winding rubber bands. It also helps speed up the event. 7. Rubber bands should be lubricated before the race. They are the motors and should be strong and flexible. 8. The end with the small hole is the rocket nose. 9. A new potato peeler is good for carving the balsa wood. 10. To help increase the rocket's speed, reduce the weight. Do not weaken the area around the hanger or carve away the nose. 11. Do not apply to much paint to the outside. 12. Make the propeller shaft as short as possible by bending it close to the prop. Cut off the excess wire with wire cutters. 13. Test the rocket's balance. If the rocket is nose heavy, sand a little wood off that end. If it's tail heavy, remove wood from tail area. 14. Use a sharp knife for cutting the grooves for the hanger fitting and fins. A dull knife will crush and splinter the balsa wood bullet. When you start to carve, remember that the end with the small hose is the rocket nose. 15. To help increase the rocket's speed reduce the wall thickness to a minimum of 1/8 inch. Do not weaken the area around the hanger (carrier) or carve away the nose button circle. 16. The plastic hanger is fastened securely to body. Super Glue works good. 1. Do not glue the front nose/propeller assembly into the front of the space derby. It is pulled off to re-load new rubber bands! 2. Do not glue the back dowel onto the rocket. It is pulled off to re-load new rubber bands! 3. Make the propeller shaft as short as possible by bending it close to the prop. Cut off the excess wire with wire cutters. 6. The propeller should have the rounded shaft-end pointing into (touching) the space derby (this makes the bending of the wire easier and it reduces friction). 8. The little plastic straw MUST go over the hook (not just the shaft as the drawing in the space derby kit illustrates) This is where the rubber bands will hook on - the wire hook will cut the rubber bands without the plastic straw liner!!! 9. The plastic dowel at the rear of the space derby to hold the rubber bands MUST be kept from rotating (groove out the back so the dowel can sit in it!) - do not glue it! 10. Test the rocket's balance by hanging it from a string through the hole of the hanger fitting. If the rocket is nose-heavy, carve or sand a little wood off of the end. It it's tail-heavy, remove wood from the tail area. 11. Propeller nose button is lubricated with graphite. Experienced rocket racers "warm up" their space ships by gradually winding the rubber band motor numerous times before races (20 winds, then 40 winds, then 60, 80, 100) -- this helps relax the elastic properties of the band and makes it more pliable and durable (this is exactly why the clowns stretch the balloons before blowing them up!). 1. A small hand drill is excellent for winding rubber bands. It also helps speed up the event. Check the ratio of the drill by making one revolution of the crank handle and count the number of times the chuck turns. Most drills average a one-to-four ratio; thus it would take 25 turns of the crank to give 100 winds on the rubber band motor. 2. When using the hand drill winder, it's best for one person to hold the rocket and propeller while another stretches the bands about 12 to 15 inches beyond the rocket tail and turns the rubber bands, he gradually shortens the distance between him and the rocket. For a more evenly matched race, wind all rocket motors the same number of turns (100 turns). 1. Painting and decorations are encouraged. Use your imagination. 2. Do not apply too much paint to the outside unless you sand between each coat. Be sure to decorate the rocket with bright colors. 3. The rocket body can be waxed to a high gloss to decrease wind resistance. The fins should be accurately aligned so rocket will fly straight.